Real time, interactive, data analytics provided via the iDecision Games platform. The iDecision Games platform allows you to run the exercise remotely or in your classroom and provides 24/7 tech support which makes setting up your class quick and easy. Now for a limited time: try one of four new Enhanced Simulation Packages on the iDecision Games platform for FREE! If you are a first-time user of the iDecision Games platform, your materials and platform fees will be waived for your first Enhanced Simulation Package. If you are already an iDecision Games platform user, your first time use of these new enhanced materials will be free. The Enhanced Simulation Package materials are $10 per copy, and iDecision Games platform access ranges from a one-time fee of $15-$50 per student, but if you are a new iDecision Games user and order by April 15th, you can try the Enhanced Simulation Package for free. Bakra Beverage is a two-party negotiation between a beverage manufacturer, BebsiCo, and a soft drink distributor, Bakra, who are negotiating a distribution contract in the Middle Eastern country of Kumar. BebsiCo is a multi-billion-dollar, multinational soft drink manufacturer interested in expanding its operations into the Middle Eastern country of Kumar. The distributor that was supposed to handle BebsiCo’s new distribution campaign, Kabir Cola, decided suddenly last week to close its Kumari operations and focus on other Middle Eastern countries. BebsiCo and Bakra Beverage are both eager to sign a new distribution contract. In addition to the wide zone of possible agreement regarding the distribution fee, the simulation includes a range of possible criteria for determining the fee as well as numerous possibilities for value-creating options. Order the Bakra Beverage Enhanced Simulation Package today. MedLee is a two-party negotiation between MedDevice, a U.S.-based Fortune 500 company that manufactures high technology medical equipment, and Lee Medical Supply, a small Thailand-based company that distributes medical equipment in Southeast Asia. These parties seek to conclude a joint venture, to be named MedLee, based out of a Bangkok sales office that distributes MedDevice brand medical equipment. The CEOs have already met and signed a Memorandum of Understanding and have now instructed their subordinates, Pat Armstrong, Director of International Strategic Market Research at MedDevice and T.S. Lee, the Vice President and son of the owner of Lee Medical Supply to conduct preliminary negotiations on four issues that are central to the joint venture. MedDevice and Lee Medical Supply differ greatly in their corporate cultures, which are shaped by national cultures and the demands of their respective industries. The respective negotiators must develop a way for companies with such divergent cultures to work together. Order the MedLee Enhanced Simulation Package today. Hydropower in Santales is a six-party, multi-issue negotiation focused on issues of public engagement in hydro-power based energy development. The Ortega Company is a new hydroelectric company that hopes to build a hydropower plant in the Cordillerana region of Santales, a fictitious South American country. In a departure from normal operations, the company has asked several different communities if they are interested in allowing a hydropower plant to be developed within their borders. Of the nine communities originally considered, two have expressed preliminary interest in the project. One is the town of Villaverde, located along the Reposado River. The development of the project could bring jobs and infrastructure investment to Villaverde, but would probably reduce the flow of the river, which could threaten the livelihoods of many community members. The Ortega Company is seeking broad support for the project and has invited representatives from the nearby indigenous community, local residents, the mayor’s office of Villaverde, and the local environmental NGO (nongovernmental organization) to meet with a representative from the company to discuss their concerns. In addition, the company has hired a professional mediator. 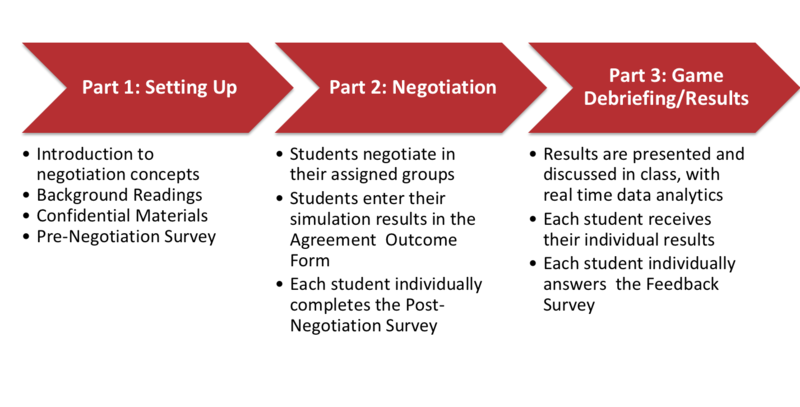 This simulation builds on basic negotiation concepts but adds complexity through not only more parties but more issues. This simulation exposes participants to different viewpoints and interests regarding energy development and related land use dilemmas, as well as addresses fundamental value differences as a key source of disagreement among parties. Order the Hydropower in Santales Enhanced Simulation Package today. How to Handle the Public Health Impacts of Climate Change is a seven-party role-play simulation involving a diverse set of stakeholders who must consider the short-term and long-term public health impacts of climate change while assessing the pros and cons of specific, and conflicting, risk management strategies. Mapleton, a city of 100,000, has just completed a Climate Vulnerability Assessment. The assessment shows that extreme heat and possible flooding associated with climate change pose substantial threats to the city. City officials asked an Advisory Group to suggest ways of preparing for possible emergencies and preventing injury and loss of life. The Advisory Group will have to wrestle with different risk management strategies and come to agreement if they want to have an impact. The Advisory Group is comprised of city officials, university planners, business representatives, and environmentalists trying to figure out how their city should respond to the possible public health impacts of climate change. Participants must consider the short-term and long-term public health impacts of climate change while assessing the pros and cons of specific, and conflicting, risk management strategies. Order the How to Handle the Public Health Impacts of Climate Change Enhanced Simulation Package today. Check out the PON Library of Enhanced Simulation Packages on the iDecision Games Platform to learn more and to get started today.